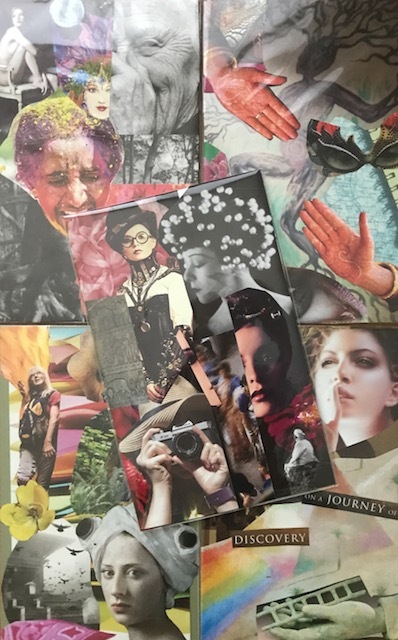 Join me and my guest Kym Gordon-Cumbo of Ignite Change Coaching and TheSlaterHousePdx, who is a creative powerhouse that utilizes image, intuition, imagination and coaching in her SoulCollage® Workshops! Kym also teaches AirBNB Host Success Coach classes, Laughter Yoga Playshops, and Resilience Reiki Trainings. 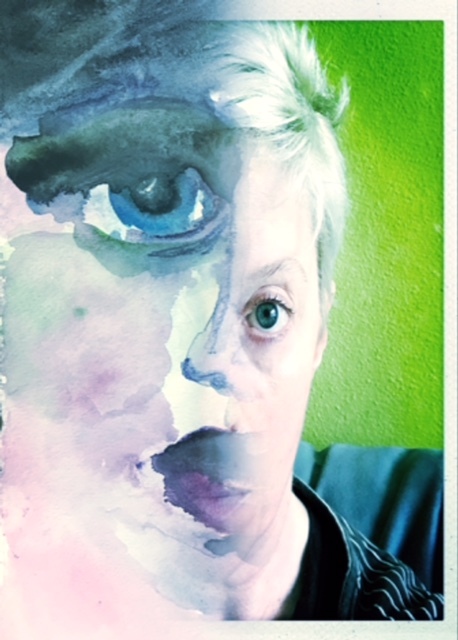 This show’s Art Vision prompt is I Am the One Who…. 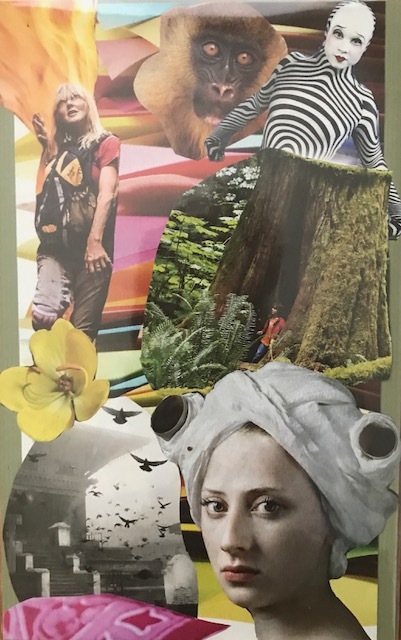 Let’s use the magic of intuitive collage to create a SoulCollage card that represents our journey of self-discovery and aspects of our Soul! I’m in a Sacred Selfies online class that focuses on the power of purposeful selfies that mirror our true essence. I took this photo after my dad’s funeral and combined it with a small watercolor painting on paper. I love how it captures my mood of sadness and rawness at that point in time. I created these SoulCollage cards in various workshops. It’s amazing how intuitively selecting magazine images and putting them together can truly capture an aspect of my personal journey and Soul at a snapshot in time. At the end of the workshop, we end with the statement, “I Am the One Who…” based on our interpretation of the images we chose for each card. It’s a powerful creative process! Read the Art Visioning process below. Contemplate the Art Visioning prompt below. Allow the Universe to intuitively reveal to you how you can express your thoughts/discoveries via collaging, drawing, doodling, writing and/or painting. Remember – there are NO mistakes in Art Vision journaling! Let your creative juices flow freely! Tell your Inner Critic to sit quietly in the corner. Intuitively select magazine photos that resonate with you. Glue them with a glue stick onto a 5″ x 8″ SoulCollage card or into your journal. Study your images and write your interpretation of the card – “I Am the One Who….” How do the images represent your current personal journey, your Soul’s voice, your personality? Connect with your Higher Self/Source Energy through meditation, yoga, walking in nature, listening to music, etc. to achieve an open/receptive mind/heart. Contemplate the Art Visioning prompt of I Am the One Who. With the prompt in mind, ask the Universe the following questions. Respond to each question or gravitate to the one(s) that most resonate with you. What do you want me to discover about this area of my life? How can I perceive this part of my life differently? What do I need to shed to manifest the best good in this area? What do I need to say yes to/allow to manifest the best good in this area? Who do I need to be in this area of my life? What is an inspired next step I can take to grow/evolve into my True Self in this area? How can I use my gifts/super powers to enhance this part of my life? Record your discoveries in your art journal – draw, doodle, paint, write, collage your way to soul clarity. Use images, words, favorite quotes, poems, minds maps, colors, etc. Mix up creativity techniques. Keep each Art Visioning journal creation as a record of how you’re progressing/evolving on your journey toward being your True Self. Feel free to share your Art Visioning creations with me on Facebook, Twitter or Instagram @vickiworldart! 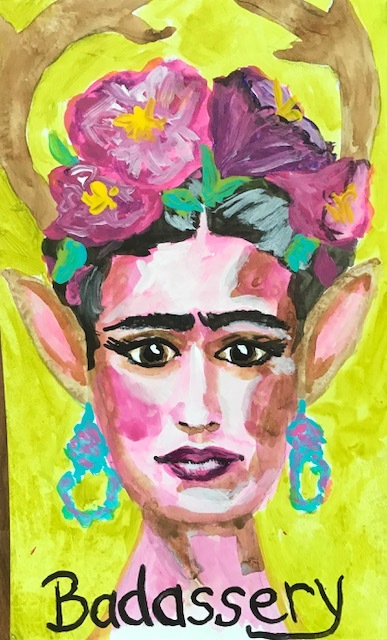 Here’s a card I painted using an image of Frida Kahlo. I use it to supplement my soulCollage card collection! Vicki is the author of a visual memoir, Unstuck: One Heroine’s Journey of Art and the Courage to Live on Purpose. She is the host of Unstuck JOY! The Art of Living on Purpose radio show on TransformationTalkRadio.com, where she encourages listeners to create their path to soul clarity through Art Visioning.